Archive for the ‘Do you ever feel like a parent fail?’ Category. Do my kids fight & Do I ever feel like a parent fail? Um yeah, they’re normal kids and I’m a normal mom! A friend asked me if my kids ever fight. Then she asked what I do about it. I rattled off some techniques that usually work and the conversation moved on. Then came the HOT DOG FIGHT! This one may live in infamy. Fight breaks out over last hot dog after an already rattling day. Siblings come up with every imaginable argument. After sitting back 5 minutes and hoping things would work themselves out, mom enters…that would be me. Mom tries the “I want y’all to sit down and use kind words and nice tones and don’t come back until you’ve worked it out” method. 5 more minutes pass. Mom tries the “throw in every related Bible verse in the book” method to calm things down. 5 more minutes. Mom tries the “life’s not fair” speech. Aaaaand, 5 more minutes. Mom realizes that 20 minutes of her life has been spent with the unfruitful goal of her children working out a reasonable agreement over a hot dog. Instead, there are literally tears. Ridiculous! NOBODY GETS THE (tempted to curse here) HOT DOG! A while later, one kid tries to twist Mom’s words to weasel into getting it! Mom’s head is in danger of exploding! Dad comes home and Mom unloads the story. 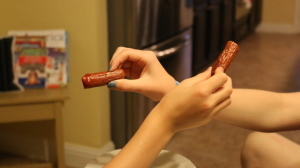 Dad calls kids into the kitchen where the table is set with two plates and the hot dog halved on them. Kids think they are getting to share the hot dog (though they are still fighting about who really should get the whole hot dog)! Dad says they are going to learn to “honor one another above [them]selves” (Romans 12:10)…. by FEEDING EACH OTHER THE HOT DOG! Lesson for the defeated me? Sometimes we parents try every trick in the book and still fail…and you know what? That’s ok! This was several months ago and we can all now laugh about it. And, I did obtain their permission to share this picture and story. I am very careful to protect my children’s privacy and am conscious that everything I post will be forever “out there.” Therefore, I try to limit or avoid the posts that could embarrass or undermine my kids. Please know that we are not a perfect family by any means. I’m bumbling along in parenting with the rest of you and my kids, husband, and I all make mistakes, do dumb things, etc. So be encouraged…We’re all in this crazy world together just doing the best we can with our faithful Father’s help! see Parenting with Scripture: a Topical Guide for Teachable Moments.